Christmas is incomplete without a Christmas tree. And a perfect Christmas tree is incomplete without a Christmas tree stand. Christmas tree stands are designed to keep the tree standing upright. The stands have to be strong and sturdy to withstand the weight of the trees. A Christmas tree stand for natural trees helps to keep them watered. It has water wells in them so that the tree does not dry out and you can have your exquisitely decorated tree ready for the festival. Here are some of the best tree stands. Weighing 8 kg, this extra large Christmas tree stand can secure any tree having a height up to 12 feet. The diameter of this tree stand is 52 cm making it a perfect choice if you are having a large tree for Christmas. Its extra-large secure system allows you to fix tree trunks having a trunk diameter up to 17 cm. Made in Germany, this tree stand is one of its kind. It can hold 11 liters of water to keep your tree hydrated. The most striking feature of this Christmas tree stand is that it has an automated water level indicator system which lets you know when to add more water. Available in two sizes- Medium and Large, the imported tree stand is made of corrosion resistant material. The water holding capacity of this stand is 1.7 gallons. Having a steel spike base it can secure any Christmas tree of height up to 12 feet and trunk diameter up to 7 inches. Four T-nut tipped eye bolts have been specially designed to securely keep the tree in place. It has four tubular steel legs with a base of 29.75 inches which can withstand heavy weight and does not bend under pressure. The gold-toned appearance adds elegance to the stand. This large Christmas tree stand weighs 5.9 kg with a diameter of 18 inches. It can hold a tree having a height and a trunk diameter of about 8 feet and 1.7 inches respectively. It can hold up to 1 gallon of water and has five-extend-able feet for providing extra support to your tree. It comes with a hassle-free installation which takes less than a minute to set up your tree. 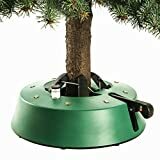 This medium-sized Christmas tree stand is specially designed to hold trees up to 10 feet in height and a trunk diameter of up to 7 inches. It has four steel eye bolts which keep the tree secured to its place. The most remarkable feature of this Christmas tree stand is that it can hold up to 2 gallons of water so that your tree stays well-hydrated. With a water holding capacity of 3 gallons, this Christmas tree stand can secure taller trees. Plywood can be used to secure the trees safely to the stand with the help of supported holes marked at the outer edge. The body is made of a polypropylene material to withstand high pressure. The most remarkable feature of this stand is that it comes with a spill guard to prevent overfilling. The reservoir at the base of the stand can also accommodate lower tree branches. With four steel legs spanning 42 inches each, this Christmas tree stand can accommodate trees up to the height of 16 feet and a trunk diameter of 9 inches. It can hold water up to 1.8 gallons. Four steel support screws with steel end caps hold the tree securely to the stand. Its powder-coated steel body adds to its durability and it comes with a lifetime warranty. The Christmas tree stand can hold a tree of height 9 feet and a trunk diameter of up to 4 and a three-quarter of an inch. The feature which makes this Christmas tree stand popular among others is that it has a foot pedal which easily secures the tree to the stand. It also has a water indicator which you can easily use to read when your tree needs more water. 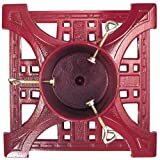 This strong and sturdy 14-inch square shaped Christmas tree stand, made of cast iron comes in a brilliant shade of red. It is resistant to rust and chipping and its brass plated hardware add to its durability. It can secure a tree up to 8 feet in height. It also has a 6-inch deep water storage can to keep your trees fresh. With a weight of 6 kg and a diameter of 39 cm, this tree stand can hold trees up to 7 feet in length and a trunk diameter of 1.5 inches. With a water holding capacity of 1.2 gallons, it comes with an automatic water level indicator. The most striking feature of this stand is that it comes with a foot pedal which automatically alerts you when the tree is held at a maximum strength. It also locks itself at the same time to prevent accidental opening. The stand comes with a patented internal safety belt for extra security. This Christmas tree stand can hold trees up to 12 feet in height. Its easy installation technique makes it a unique choice among others. It can hold large amounts of water. Made in the United States of America, this tree stand is known for its sturdiness and durability. These are among the top 10 and the most rated Christmas tree stands of the year. They not only support and secure your trees but also add a touch of style and elegance to your celebrations. So, go ahead and choose among these finest options, whichever suits you.